There were several launch delays, at first the upper level winds were too strong, then there was a propellant issue, but then finally they launched before the weather moved in again. The team also took place in the educational activities centered around the GRAIL launch. This included a public event with an IMAX theater and exhibit center. The team set up the NLSI booth, a giant Moon globe, and gave demonstrations of projects including Exploration Uplink, MoonZoo, International Observe the Moon Night, and Eyes on the Solar System. Kids know a lot about space and details of other planets. With Eyes on the Solar System, the team shows people the solar system, lets them fly through it and explore wherever they want. People are given a gateway to see what they want to see and learn about what they want to study. 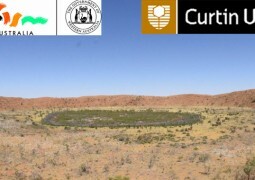 The shock metamorphism in terrestrial and extra-terrestrial rocks workshop is June 26 – 29, 2017 at Curtin University in Perth, Western Australia.